Multi-dimensional Array in Java Programming – In this article, we will brief in on all the possible ways to evaluate multi-dimensional arrays in Java Programming with sample program. In case if you have any doubts about this tutorial do leave a comment here. All the methods will be explained with sample programs and suitable examples. The compiler has also been added so that you understand the whole thing clearly. An array, as we all know, is a collection of multiple elements of the same data type. Arrays are normally used to store information of one particular type of variable. As the name of the title suggests, multi-dimensional means any particular entity having 3 or more than 3 dimensions in reality. Similarly, a multi-dimensional array in Java usually has 3 or more defined indexes, but in reality, one particular row of elements have another multitude of elements defined on their names. Basically, you can have a 3×3 or a bigger matrix of elements to define a multi-dimensional array. As you can see as per the image uploaded above, firstly, you need to specify the number of rows and columns respectively. The example roughly explains the structure of a 3×4 matrix. So, the total number of elements that will be entered is 12. These elements will be arranged accordingly and the multi-dimensional array will be printed for you. 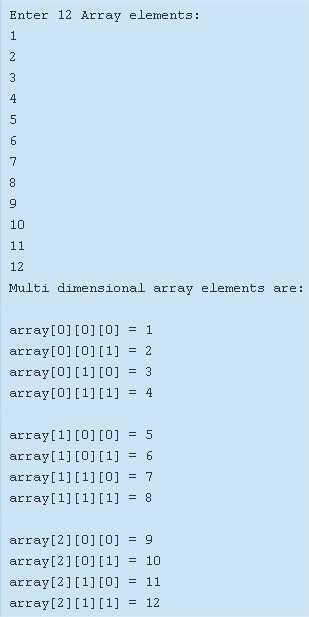 To insert the elements in to multi dimensional array a, we are using for loop. insert the element at a[i][j][k]. To insert the elements in to multi dimensional array array we are using scanner class. sc.nextInt() method reads the entered number and inserted the number in to array[i][j][k] . Initialize the strings as elements in to the multi dimensional string array str. 2) Print the strings from multidimensional array str. print the string available at the index str[i][j][k]. Java Program To Print Multidimensional String Array.